Originally appearing in the Industrial Worker, a short piece by Matt White on some of the IWW members who died during the Spanish Civil War. Not surprisingly, a number of Wobblies went to Spain to fight in the Spanish Civil War. Several served with the Confederación Nacional del Trabajo (CNT), while it appears the bulk served in the International Brigades. Wobblies such as Mike Raddock, Ray Steele and then-future Industrial Worker editor Pat Read acquired reputations as some of the finest soldiers in the 15th International Brigade. Records from the Spanish Civil War and 1930s IWW are incomplete, making it impossible to know with any certainty how many Wobblies went to Spain. I’ve discovered over 20 people who either listed themselves as Wobblies or who others remembered as Wobblies. Of that group of Wobblies, eight were killed in Spain and one died shortly after he returned from Spain from wounds he received there. For reasons unknown, the Industrial Worker never commemorated the deaths of five of the nine fellow workers listed here. So this November, 75 years since the last act of the Spanish Civil War, we remember. Heinrich Bortz. According to his obituary in the Oct. 23, 1937 issue of the Industrial Worker: “Fellow worker Bortz was a German and belonged to the I.W.W. [sailors’] branch in Stettin.” The obituary related that the Nazis threw Bortz into a concentration camp. Bortz then escaped the camp and made his way to Denmark and then to Sweden. In Sweden he continued to be active in radical labor. In 1936 he traveled to Spain and joined the CNT’s Durruti International Battalion where he was killed in action. Ted Dickinson. Dickinson joined the Australian IWW in 1923 and edited the Australian IWW paper, Direct Action. Dickinson was jailed for his IWW activities. Dickinson went to England shortly after his release from prison in the late 1920s. 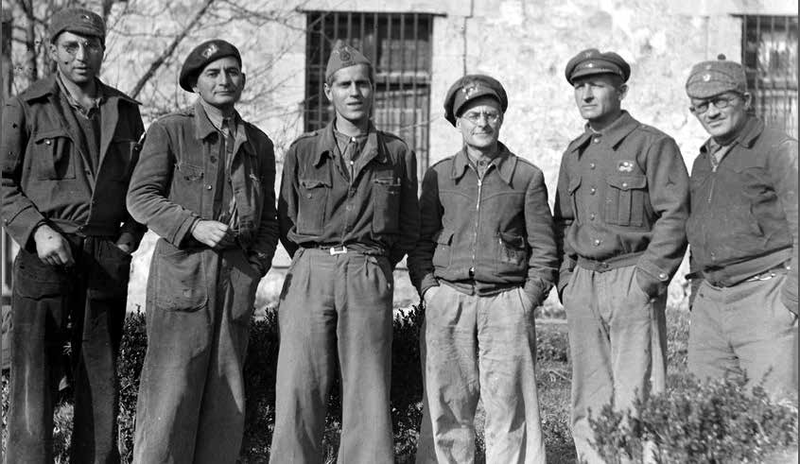 Dickinson joined the British Battalion of the International Brigades and was second in command of the second company. In 1937, he was captured and executed by the fascists. Harry F. Owens. Owens was an outspoken anarchist sailor who joined the IWW in 1921 after he became infuriated with the conduct of the International Seamen’s Union. Before Owens left for Spain, he helped lead an IWW strike against a ship carrying goods to the fascists in Spain. There is not too much information about Owens in Spain, but he was a member of the Lincoln Battalion and was killed sometime in mid-1937. Louis Rosenberg. According to his death notice from the CNT, Louis Rosenberg was killed in action with the Durruti International Battalion of the 26th Division, on the Aragon front, June 16, 1937. Rosenberg was 24 years old and joined the IWW Industrial Union (IU) 120 Timber Workers at Port Arthur, Ontario. He took part in the Thunder Bay strike of 1934 and the Algoma District strike of 1935. His obituary mentions an unnamed Pennsylvania anarchist who was killed at the same time. Lawrence K. Ryan. Ryan was the Las Vegas branch secretary in the early 1930s. In that role he would have been involved in the Boulder Dam organizing drive. Ryan was an early Lincoln Battalion volunteer who was severely wounded during the Feb. 27, 1937, attack at Jarama. According to his friend D.P. Stephens, Ryan died a year later in Canada, probably related to his Jarama wound. Herbert Schlessinger. In an interview, Schlessinger claimed to have been a liaison between the Sailors’ Union of the Pacific (SUP) and the IWW, which makes perfect sense as the SUP had an alliance with the IWW during the latter half of the 1930s into the 1940s. He was killed in action with Lincoln Battalion in the latter part of 1938. Ivan Alroy Silverman. Silverman was a member of the IWW construction workers in Los Angeles. Silverman arrived in Spain during the latter half of 1937 and was a member of the Lincoln Battalion. Silverman was listed as killed at Gandesa in April 1938. Raymond Albert Steele. Steele was another Wobbly seaman. According to Lincoln Battalion veteran Dave Smith, “Ray Steele always expounded on the superiority of direct action as a tactic.” Steele was fondly remembered as one of the best soldiers in the Lincoln Battalion and one of the best machine gunners of the Tom Mooney Machine Gun Company. According to International Brigades records, he was killed on July 15, 1937, during the Brunete campaign. There are several different versions of Steele’s death, but the consensus view is that he was killed by a sniper. Robert Charles Watts. Watts was a Gulf port sailor when he volunteered for Spain. He claimed to have served in the Mexican Army in the 1920s. He served in the Mackenzie-Papineau Battalion and was killed in action in late March or early April of 1938. There were stories that the old timers of the IWW used to tell and which seemed to be confirmed by one letter from a wob I saw years ago and this was how in NYC some anarchists and wobs were helping to send people to fight with the CNT but Thompson was steering people towards Comintern controlled units. If I remember correctly, the Anarcho-Syndicalist Review did a huge piece some years back on the involvement of IWW members in the Civil War.